MANILA, Philippines – Those awaiting LET results, together with the complete list of passers for the teachers board exam given last September 30, 2018 are available online as released by the Professional Regulation Commission (PRC) on December 7 or in 47 working days after the exam. 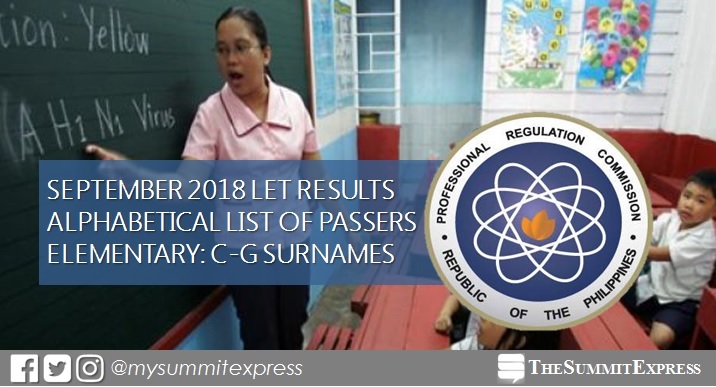 Takers may view on this page the alphabetical list of of passers for Elementary level - C to G Surnames. According to PRC Resolution No. 2017-1068, the target release of September 2018 LET board exam results is on Tuesday, December 4 or in 44 working days after the test.